These are great Hallowe'en Crafts! 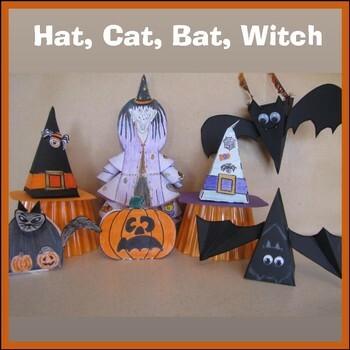 Includes step-by-step instructions and templates needed to create a Cat, a Bat (actually 2 bats), a Hat, Zelda the Witch, a small decorative pumpkin and 3 Hallowe'en cards. Requires: Paper (light cardstock is recommended), glue, coloring pencils and scissors, a single hole punch and string to hang up the bat! Also, I added googly eyes to the bats and I think they really look great!